Stroll along Ocean City’s Downtown shopping district, and you never know what gems you’ll find. Nestled on the corner of 7th Street and Central Avenue is Handlaget Shop, showcasing custom furniture and home pieces, refurbished vintage furniture, painted wood, and many other unique items. Handlaget isn’t your typical furniture shop. Walk in, and you’ll be surrounded by rustic furniture and other specialty pieces from all time periods – being repaired, refreshed, and repurposed. Tina and her son Paul have been working together for years creating custom woodwork for customers near and far, as far as Albuquerque, NM, in fact. “We used to create and sell out of our home, but we got busier than we imagined, and knew it was time to open a storefront to display our work,” said Tina. Realizing the business’ success has not been an easy journey for Tina and her family. A social studies teacher for years at Atlantic City High School, Tina got laid off with more than 200 other school employees when the casinos began shutting down. Tina credits Paul for helping to build the business, drawing upon his many years experience in woodworking. Paul says he started out making small pieces for friends, then one thing led to another, and his business took off more quickly than he imagined. Now he’s expanded into a full working woodshop down the street from the Handlaget storefront, where he handles the majority of the custom woodworking. “I do an extensive amount of major projects, more than patching and repairing. Farm tables are huge right now. I do countertops, shelving, and use all raw, natural wood. I try to source as much local wood as I can, especially red and white Jersey cedars,” said Paul. What drives Paul is his partially-Norwegian background, and his appreciation for the Handlaget philosophy. While Paul’s days are spent crafting and perfecting a solid piece of furniture, Tina devotes much of her time leading classes, where everyone is welcome to come in and create their own individualized piece, while learning and having lots of fun too! Classes are scheduled one to two times a week. The two hour session focuses on one project, such as custom wooden signs, vintage artwork, refurbishing old frames, or jazzing up glassware. Tina says she sees an increase in private parties closer to the holidays, as people enjoy creating gifts for family and friends. As far as materials go, they try to locally source as much wood as possible, from old barns, demolished homes, and even have a network of people on the lookout for reclaimed lumber. In keeping with their eco-friendly mission, Handlaget primarily uses chalk paint, which is all-natural, non-toxic, and doesn’t give off fumes. That’s particularly important to Tina given her personal experience. You don’t have to strip down old paint, and it doesn’t require massive sanding. You just paint, seal, and you’re done,” she said. 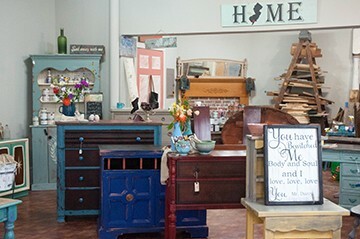 If you’re visiting this fall, Tina says feel free to stop in anytime to try out the chalk paint, and then some. “You never know what you’ll find here,” she said. One thing is certain, you’ll find a team of extremely talented and hard-working people looking to contribute to their Ocean City community, locals, tourists, and business owners alike. Handlaget’s fall season is chock full of classes, including picture frame wreaths for Halloween, vintage bike signs with 10 percent of the proceeds going to the MS City to Shore fundraiser, fall subway style signs, glowing luminaries, and more. For information on classes, visit Handlaget’s social media pages: Instagram – Handlaget Store and Facebook – Handlaget Shop, or call 609-741-1635. Unless noted, Thursday evening classes begin at 6:30pm, and class pricing starts at $40.